A near simultaneous launch of the 2012 Acadia National Park Quarters occurred on Monday, June 11 by the United States Mint and the Federal Reserve Banking System. The new coin features a design emblematic of the national park located in the state of Maine. As with all America the Beautiful Quarters®, the U.S. Mint produces circulating quality Acadia park quarters at its facilities in Philadelphia and Denver. Orders are filled for the Federal Reserve for distribution to commercial banks and financial institutions and to supply rolls and bags for collector sale. Mintages for the quarter stand at 51.6 million, with splits of 26.8 million for Denver and 24.8 million for Philadelphia. Acadia quarter 100-coin bags and two roll sets went on sale at 12:00 noon Eastern Time (ET) for $34.95 and $32.95 respectively. Like the other 2012 quarter products, prices have declined from the 2011-dated issues that are still available. Buyers have the choice of quarters struck at Philadelphia or Denver for the 100-coin bags, while the two-roll sets contain 40 quarters from each facility to total 80 coins. While the coins in these products are circulation quality, they have not entered circulation. 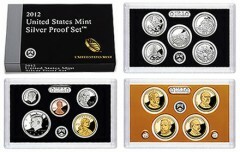 Packaging for products sold by the U.S. Mint to the public is fancier than packaging used to fill orders at banks. The Mint brands their collector items with their logo and their black on white decor that indicates the name of the national park and the two-letter state’s abbreviation, the year, and the manufacturing city. The design selected to represent Acadia National Park on the reverse features Bass Harbor Head Lighthouse and pine trees above a rocky shoreline. The design was crafted by Barbara Fox and sculpted by Joseph Menna. Inscriptions include ACADIA, MAINE, 2012, and E PLURIBUS UNUM. On the other side is the familiar image of George Washington, the first President of the United States. Since 1932, his portrait, by John Flanagan, has graced the obverse of the quarter. For the America the Beautiful Quarters, however, the image was digitally restored to bring out the subtle details of the original model. Inscriptions on the obverse are UNITED STATES OF AMERICA, LIBERTY, IN GOD WE TRUST, and QUARTER DOLLAR. 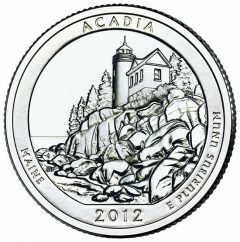 Another upcoming product will be the 2012 Acadia Park Quarter Three-Coin Set that will hit the market tomorrow, June 12. Later, there will be circulation quality Acadia quarters from San Francisco released solely for collectors in rolls and bags. Additional U.S. Mint coin products that will feature the same design as the Acadia quarter will be the large silver coins, having three inch diameters and weighing five ounces. The investment quality Acadia National Park 5 Ounce Silver Bullion Coin will likely go on sale first but only to the U.S. Mint’s authorized purchasers. They will, in turn, sell the coins to the public. The collector quality Acadia National Park 5 Ounce Silver Uncirculated coin, on the other hand, will be sold directly to the public from the Mint, but its release date has yet to be officially announced. 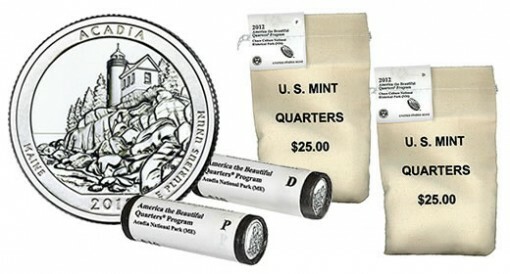 Acadia quarter rolls and bags, as well as its related products, may be purchased via the United States Mint website, located here, or by calling its toll free number, 1-800-USA-MINT (872-6468). No household order limits or mintage limits have been issued. The standard $4.95 shipping and handling fee will be applied to all domestic orders. 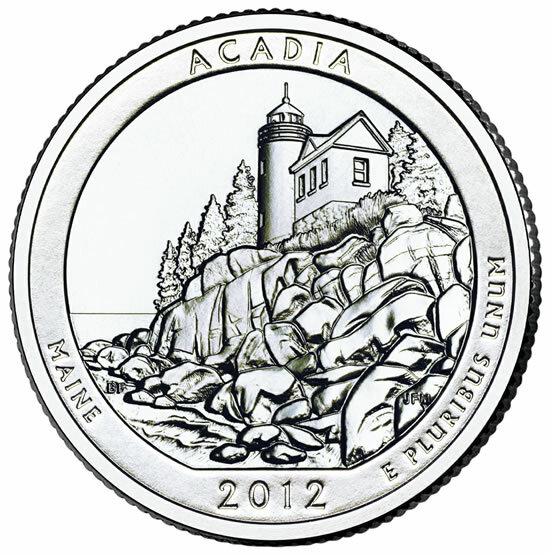 Acadia quarters are the third of five to launch in 2012 and the thirteenth overall in the America the Beautiful Quarters series that began in 2010. Preceding designs this year honored El Yunque National Forest in Puerto Rico and Chaco National Historical Park in New Mexico. A complete set of the America the Beautiful Quarters will consist of 56 coins but will take until the year 2021 to finish. The United States Mint began striking the coins in 2010 at a rate of five per year to honor a national park or site in every state, territory, and the District of Columbia in the United States. Acadia National Park was first established as a national site on July 8, 1916. It can be found about midway up on the eastern side Maine. Besides being home to the tallest mountain on the U.S. Atlantic Coast, Cadillac Mountain, Acadia has over 120 miles of trails for hiking, which includes 45 miles of carriage roads, to take visitors to its forested valleys, scenic lakes, and rugged coastline. For more information about the 49,000 acre park, visit the National Park Service website for it at www.nps.gov/acad.